LOS ANGELES--(BUSINESS WIRE)--Ace Metrix, the leader in measuring the impact of video advertising, today published the results of a joint study with BuzzFeed that reveals the type of content that delivers the best results for Long Form Native Video (LFNV). LFNV is video content between 90 seconds and five minutes that is sponsored or co-branded by an advertiser. The study, entitled “Capitalizing on the Content Era: Leveraging Native Video to Drive Brand Equity,” details the potential benefits of these long form native video and demonstrates how those benefits are amplified when executed in conjunction with television ads. Ace Metrix and BuzzFeed will co-present the findings in a webcast hosted by Advertising Age on April 21, 2016. Details below. In fact, the study found that native video performs on par with TV ads for overall ad effectiveness, driven by its ability to grab attention. Moreover, when paired with TV ads that focus on product education or desire building, LFNV can enhance a brand’s ability to better break through and connect with consumers holistically. However, as with TV ads, the most successful long form digital ads are those that have a relevant connection with the brand and target consumers. 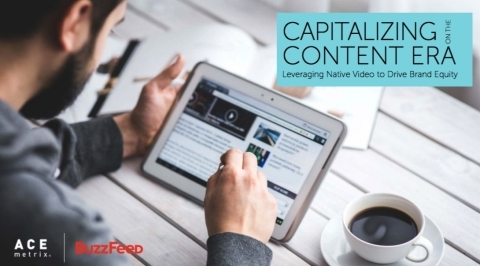 “Capitalizing on the Content Era: Leveraging Native Video to Drive Brand Equity,” is based on analysis of 79 long-form native videos created by BuzzFeed, Funny or Die, Mashable, College Humor, Vice, Refinery29 and Maker Studio. The study took place from June to December, 2015. 1) Try using emotion to connect with consumers. Top performing LFNV ads made a strong emotional connection with viewers and were able to entertain by leveraging heartfelt sentiment. 2) Tell a cohesive story that entertains viewers. Having a story arc and clear resolution hooks viewers and entices them to want to keep watching. 3) Provide practical tips that consumers will find useful. 4) Using text overlays in your video provides a great opportunity to further punctuate your message. 5) Make sure the content of your video has an authentic tie-in to your brand. These findings and more will be presented during a webinar hosted by Advertising Age on Thursday, April 21, 2016 at 11AM PST/2PM EST. Please contact us to receive sign up information. BuzzFeed is a cross-platform, global network for news and entertainment that generates more than 6 billion views each month. BuzzFeed creates and distributes content for a global audience and utilizes proprietary technology to continuously test, learn and optimize. Ace Metrix/BuzzFeed study reveals ways brands can optimize long-form native video content, including best practices on creating authentic branded content that viewers will want to watch, seek & share.